For this weekend’s Jewish holiday of Shavuot (celebrating God’s giving the Ten Commandments and the Torah (five books of Moses) to the Jewish people at Mount Sinai) it is customary to eat a dairy meal, and my German, non-Jewish grandmother’s rice pudding (“Reisauflauf”) is the perfect recipe for that because in the Bohemian kitchen, a “Mehlspeise” (sweet dish) is often served as a main meal (a custom my American mother never quite understood but we kids loved!). I actually make Reisauflauf for my kids way more often than Shavuot because they love it so much, and thus an Old World culinary tradition is alive and well. It is super easy to make; the only skill you need is knowing how to separate eggs (a crucial skill in the Bohemian kitchen! 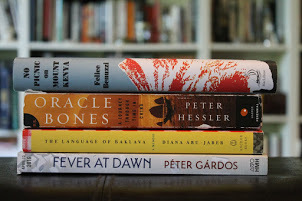 ), and time (about 2 1/2 hours). I love these old recipes that don’t require many ingredients, or complicated procedures–just time… This recipe serves 4-5 people comfortably; if you have fewer people, there will be leftovers but it tastes good cold as well. Set out casserole dish, put one tablespoon of butter into it to soften. Also set out the eggs to warm up to room temperature (which makes them fluffier when you beat the egg whites later). Take two tablespoons of milk from the milk you measured out and set them aside in a cup. Warm up your oven to 110°F (40°C). In a big pot, warm up 1 1/2 cups of the milk at medium heat, stirring continuously so it doesn’t burn at the bottom. Heat it until it starts to steam. 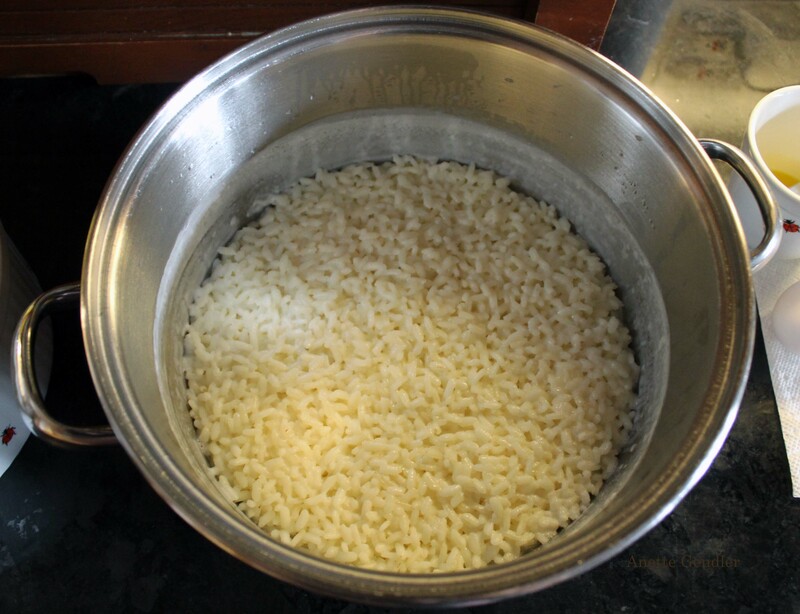 Add the rice and keep stirring at the same heat setting until most of the liquid is absorbed, then add another 1 1/2 cups of the milk. Keep stirring until the liquid is absorbed again, then add the last bit of the milk and bring to a boil, stirring all the while. Once the mixture bubbles, turn off the heat, cover the pot with a tight lid and put it into the warmed-up oven. Let it sit in there for 45 minutes to an hour, until all the liquid is absorbed. The rice mixture should look like this when it comes out of the oven. Preheat oven to 350°F (180°C). Separate one of the eggs, set aside the egg white, and beat the one yolk with a fork, then stir it into the rice mixture. Grease the casserole dish with the butter that has now softened, then pour half of the rice mixture into the greased casserole dish, distributing evenly. 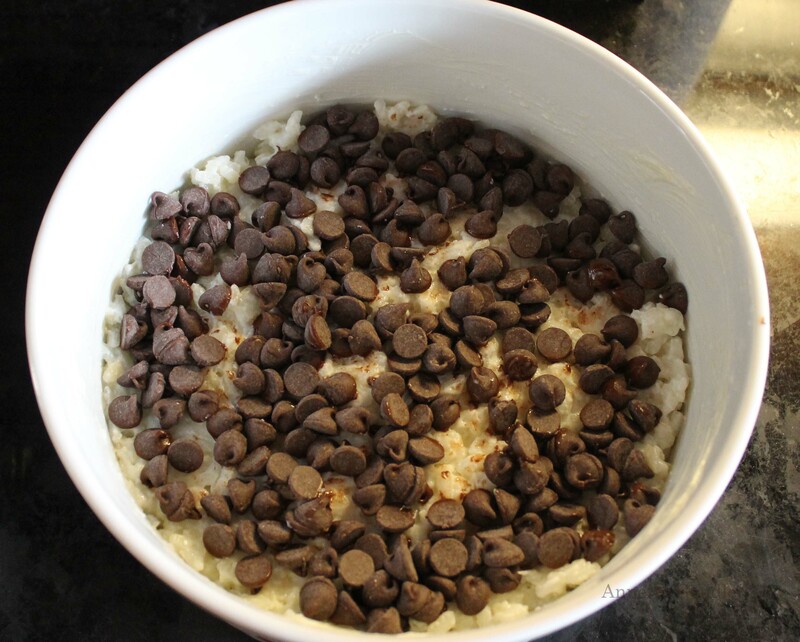 Sprinkle the chocolate chips over the rice to create an even layer of chocolate. Spread the rest of the rice mixture over the chocolate chips. Separate the second egg, adding the white to the other white you set aside earlier, and mixing the yolk with the two tablespoons of milk you also set aside earlier. 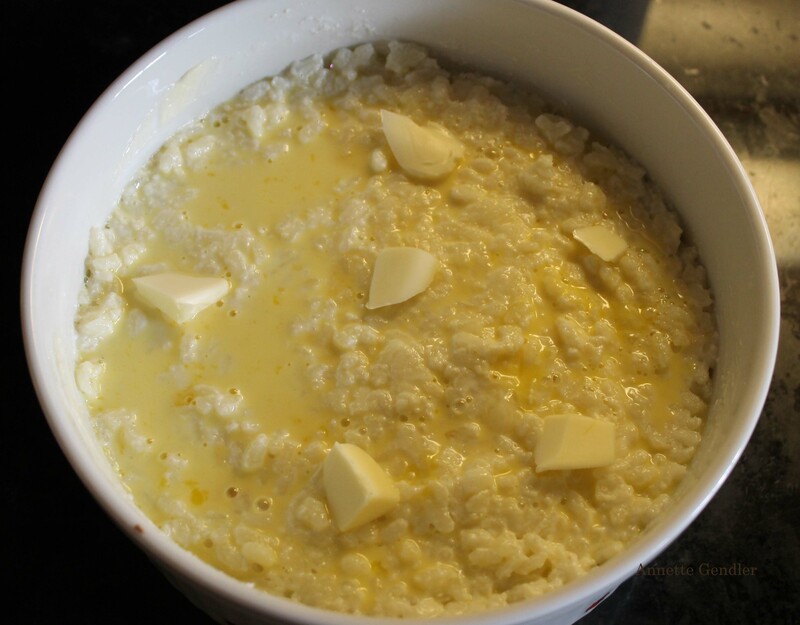 Poke the surface of the rice mixture with a fork, then pour the egg/milk mixture over it. Dot the surface with bits of the second tablespoon of butter. 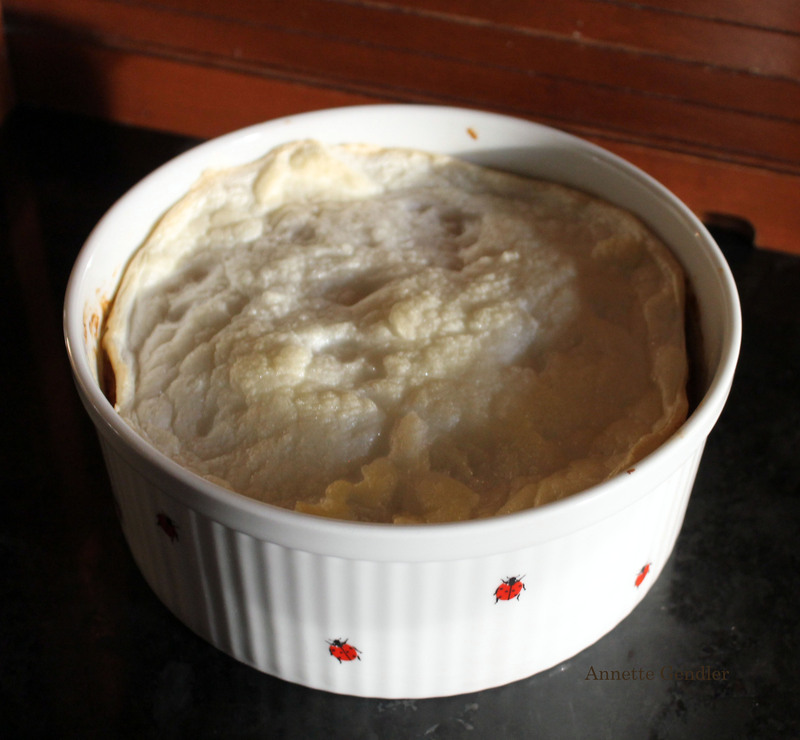 Put the rice pudding in the oven and set to bake for 1 hour. After 45 minutes, beat the egg whites until they are stiff and peaks form, pour in a teaspoon of sugar for taste while you’re beating. Take the pudding out of the oven, but don’t turn off the oven. Spread the egg whites over the pudding, then put it back in the oven and bake for the rest of the time (5-10 minutes), until the meringue is slightly browned. That’s it! Serve warm. Have a bowl of sugar on the table as the pudding is not particularly sweet, so people can sprinkle sugar on as needed. This is a full meal. I serve it with grapefruit halves as dessert, to have something sour to balance out the meal. My sister serves sour cherries as dessert. For another easy recipe from my grandmother, check out the Hazelnut Torte I always make for Passover. Thanks, and I hope you try to make this one!